It’s nearly two years since her father’s death and Ursula Marlow is embroiled in personal and professional struggles. Her relationship with Lord Wrotham has cooled since she rejected his marriage proposal and she continues to fly in the face of society’s conventions as to the appropriate role of a woman in Edwardian England. Now she is besieged on all fronts as she struggles to succeed as an independent businesswoman, despite financial difficulties, labor unrest and arson attacks on on her mills and factories. While on a business trip to Egypt, Ursula witnesses a friend’s murder in Cairo’s Khan el-Khalili bazaar, and embarks on her own investigation, convinced the Egyptian police and Scotland Yard are mistaken in assuming the death was politically motivated. 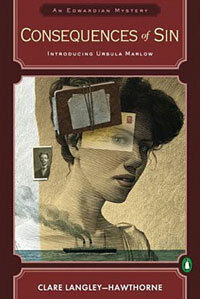 Days later a young woman dies in a fire in one of Ursula’s factories in England….. This sequel to CONSEQUENCES OF SIN seemed to start off a little slowly, but then there was quite a bit for us to learn. Most of the action is set in 1912, and the author provides several pointers to the period, including the testing of the Bleriot biplane, the sinking of the Titanic, the preparations for war, and descriptions of fashion. There are references also to events from the first novel when Ursula’s friend Winifred was accused of murder. Both Winifred and Ursula are suffragettes participating in the militant activities of the WSPU, particularly the window-smashing that characterised 1912. Ursula too is trying to do her best for women by providing safe employment conditions for women from poor socio-economic circumstances. Interesting too was the preoccupation with the effects of Bolshevism in England. 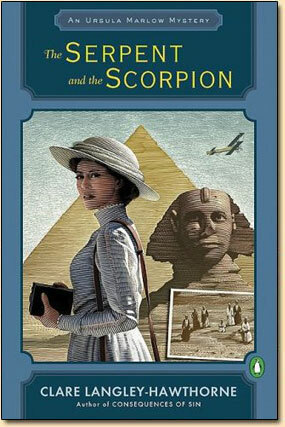 THE SERPENT AND THE SCORPION is quite long and detailed, but picks up momentum in the last third. The romance element between Ursula and Lord Wrotham is sustained throughout, although I felt his character still remained a bit obscure. I did feel like shaking them both at times! The ending is a cliff hanger that ensures there will be a 3rd title in the series. We are not out of the woods yet! Clare has some biographical details on her site, but has, since writing them, returned to live in Australia. THE SERPENT and THE SCORPION is Clare’s second novel. My rating: 4/5, One-liner: Historically accurate, delightfully complex yarn full of wonderful imagery.